A Portrait of Isis, by Feather Collector. See it here. This reminds me of a vision I had of Her long ago. I have been writing this blog since May of 2009 and it seems that the time has now come to put it on hiatus. I don’t know for how long. A while. As some of you may know, I work full time at a rather demanding job. This leaves me only weekends to write. Since 2009, I have been spending pretty much all of that writing time on this blog, leaving me none for other projects. The good news is that I find I have a significant new writing project to which I wish to devote that time. Yes, a book, but I won’t say what it is right now. It, too, will be a while. There’s much research and much meditation still to be done. But you can be sure it will grow from our work together with the Great Lady of Sacred Magic. Of course, you can still reach me here at Isiopolis for comments and questions as usual. I’ll stay in touch. And remember, there are 325 posts that still live here at Isiopolis, so I hope that you just might find something of interest to read while I’m out. Thank you all so much for reading Isiopolis…and I’ll see you again on the other side of my project. Next Next post: New article in a new book is out! Thank you so much Isidora, I have followed your blog every week and it has played a big part in the re-enchantment of my world and even inspired a project of my own. I wish you all the very best and hope to read more of your writing in future whether in blog or book form. Thank you all so much! I’ll miss it, too…but I will indeed be busy. I will miss you in the mean time my friend. May Iset bless you. May She nourish and renew you in all ways. Thank you for heeding Her Call, so that we may read your words Divine from your sacred time together. I can truly say that your blog will be sorely missed. At times when I’ve felt I lost touch with the Goddess your posts always brought me back to some aspect of Her that invariable guided me back to Her loving embrace. Between your wonderful books and this blog I’ve always been able to stay on track. As a solitary it can difficult at times. That said, I anxiously await your next book – though having written a book myself I realize the time involved – and that happy day when time permits you once again to share your wealth of research and insight into the Goddess we all love and adore. I read today’s post with great sadness, but understanding. There have been many times in my short relationship with the Goddess that my faith has been shaken. In those times I’ve invariably been guided back to Her loving embrace by your books and your blog. Your research and insight have been invaluable to me reuniting with the Goddess Who’s been ever with me. And for that I’ll always be grateful. That said, I anxiously await your next book, though having written a book myself I know the time involved in preparation. I also await that happy day when time permits you to return to Isiopolis where you’ve enchanted us for so long with your wealth of knowledge. Thank you, Isidora, for all you do. I can only imagine how many others you’ve helped on their search for the Goddess. Reblogged this on Setjataset (Madam Magick). Just thought I’d mention something very inspiring about your blog. On reading it is clear that new knowledge about the origin or evolution of the image of Isis does not in any way detract from the core relationship with Her. Compare this with some traditions where newly uncovered knowledge about a particular view of divinity, especially relating to how it might have changed over time, is seen as a threat and often something to be suppressed or ignored. The difference between a living tradition and ‘divine recapitulation’ perhaps? Thanks so much for all you have done! This information is incredibly valuable; the more we know about Isis the better we can make sense of this crazy world and find our places in it. Cheers! 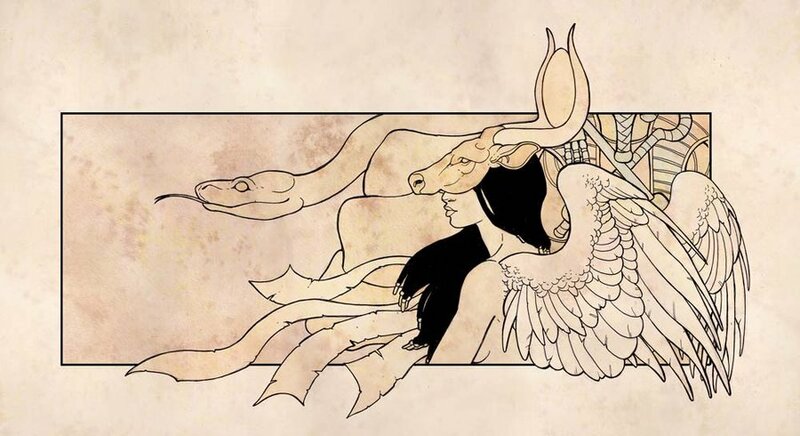 I apologize for commenting late – my connectivity is somewhat limited – but I just have to say that I am indebted to you for this wonderful site, and for your excellent book Isis Magic, for my growing relationship with the Lady of the Wings. I wish you well with your new project, and I’m glad I’ll still be able to consult this wonderful resource as my relationship with Isis continues to grow. May Her blessings always be with you! Amma, Iset. I wanted to thank you for your blog, and taking the time out of your schedule to share your insights with the world, and me. I almost feel as if I found it a bit to late, but the beauty of your blog is that it permeates eternelly, to each person, blessed, searching along their path to discover that ‘re-enchantment’. Thank you again, and bless your path as you continue to share your heart with the world…. I’m saddened that I found this blog months after you put it on hiatus (but then, it wasn’t until about a week ago that I understood the Lady of the Light had been trying to communicate with me for a very long time), but happy that it’s up. It’s a treasure trove. Your posts have given me great insight on Her and guided me into understanding how I want to go about my practice with/of Her. Thank you. Really, thank you. And of course, thank you to Aset for inspiring you to make this blog and for bringing me here when I was scratching my head. I look forward to your return and I send you light so that you do well with your book.